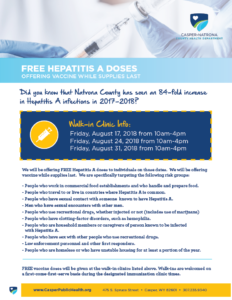 The Casper-Natrona County Health Department (CNCHD) offers a wide variety of vaccines for all children in Natrona County. For the highest quality service, we recommend making an appointment for immunizations. We do take walk-ins for immunizations; however, wait times for walk-ins may vary greatly based on availability of staff, other pre-existing scheduled appointments, and other factors. Please call 307-577-9757 to make an appointment for immunizations. A parent or legal guardian must accompany children under 18 and should bring a copy of child’s immunization record. To access the US Centers for Disease Control and Prevention’s recommended immunization schedule for birth up to 18 years (including catch up), click here. 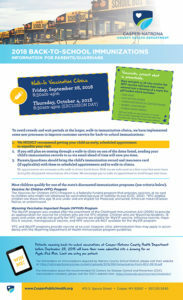 Click here to complete the form for immunizations and bring it with you to the Health Department. The Casper-Natrona County Health Department offers a wide variety of vaccines for adults in Natrona County. An appointment is necessary, please call 307- 577-9757 to schedule. Click here for the US Centers for Disease Control and Prevention’s recommended immunization schedule for adults. Most children qualify for one of the State of Wyoming’s discounted immunization programs (see criteria below). Patients will be subject to a vaccine administration fee in accordnace with State of Wyoming immunization program guidelines. The Vaccines for Children (VFC) program is a federally-funded program that provides vaccines at no cost to children who might not otherwise be vaccinated because of inability to pay. VPC-eligible children are those who are age 18 and under and are eligible for Medicaid, uninsured, American Indian/Alaskan Native, or underinsured (where required vaccines are not covered by the individual’s health insurance plan). The WyVIP program was created after the enactment of the Childhood Immunization Act (2006) to provide appropriation for vaccines for children who are not VFC-eligile. Children who are Wyoming residents, 18 years and under, and do not qualify for VFC vaccine are eligible for WyVIP vaccine. The follow vaccines are NOT available trhough the WyVIP program: influenza vaccine, Hepatitia A vaccine, meningicoccal vaccine, and HPV vaccine. For those vaccines not covered by WyVIP, patients will be charged based on the clinic’s current fee schedule. Adults who do not have access to health insurance coverage for immunizations can receive discounted vaccines through the VUA program. The VUA program provides certain vaccines to adults who are 19 years and older and who are uninsured or whose insurance plan does not cover recommended adult vaccines. Patients are charged an administration fee and the vaccine itself is free. To inquire whether you or your child qualify for one of the above State of Wyoming vaccine programs, please call our Disease Prevention Clinic at (307) 577-9757.